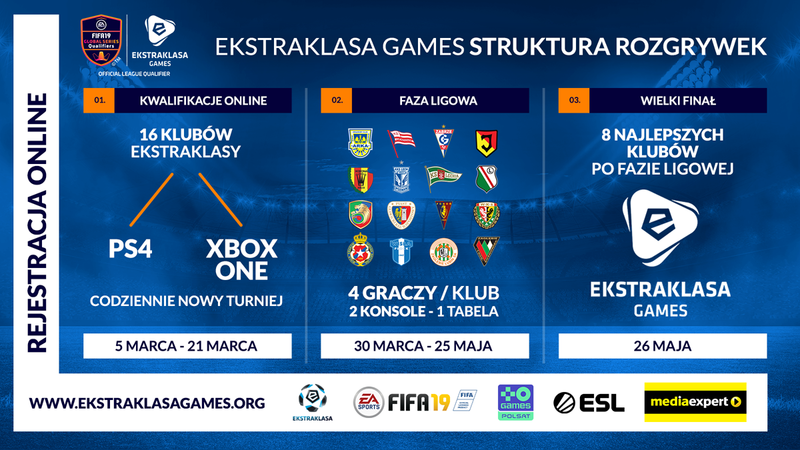 Ekstraklasa Games – the biggest EA SPORTS FIFA tournament in Poland open to everyone playing the most popular football game on the market – starts on 5th March. Ekstraklasa joins an exclusive group of football leagues, which have launched their own esports competitions – including among others the Premier League, Bundesliga, La Liga, Ligue 1, and MLS. Ekstraklasa Games is an Official League Partner of the EA SPORTS FIFA 19 Global Series – making it the only Polish tournament enabling top Polish FIFA players to collect FIFA Global Series ranking points on the road to qualification for the FIFA eWorld Cup 2019. The competitions are open to both amateurs and professionals. Irrespectively of their skill level, all players can put on the colours of their favorite Ekstraklasa club and become the star of the tournament. The best ones will have the opportunity to turn professional. For registration, please visit the official tournament website: EkstraklasaGames.org. The qualifications, which will take place on 5th-21st March, will include 32 online tournaments for fans of all 16 clubs on two consoles: PlayStation 4 and Xbox One. The winners will represent their clubs in the league stage starting on 30th March. Each of the 16 clubs will be represented by four players in all (two on PlayStation and two on Xbox). The top eight clubs after the league stage will be promoted to the Grand Final that will take place on 26th May. The winning club will be crowned Ekstraklasa Games Champion. The league matches and the Grand Final will be broadcasted on TV on Polsat Games channel, as well as on Twitch and YouTube channels of Polsat Games. “Ekstraklasa wants to be a part of various communities and is looking for innovative solutions to help promote the Polish league. We realise that esports is growing in popularity, and become an important part of the lives of youth. Entering the virtual football world is a natural step, and a necessary one. During the two previous EA SPORTS FIFA Ekstraklasa Cups that we have organised in 2017 and 2018, the interest in the project from both fans and potential business partners exceeded our expectations.” says Ekstraklasa S.A. CEO Marcin Animucki. 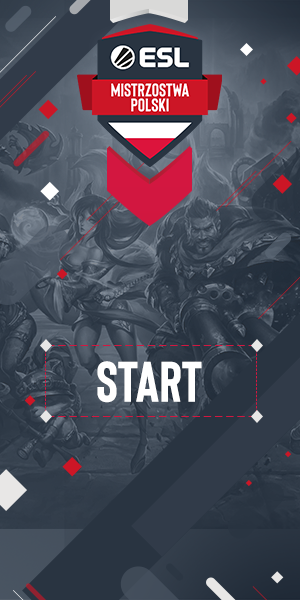 The project is being carried out by a group of partners who know the world of esports very well and have extensive experience in handling the most important Polish sports and gaming projects. The strategic media partner is Polsat Games and the cooperation with the publisher of FIFA 19 – Electronic Arts Poland – is key. The esports agency in charge of coordinating the tournament is ESL Poland and the entire project is monitored by the sports marketing agency Lagardere Sports. “Ekstraklasa is the next football league to join the exclusive group of Official League Partners in the Global Series. This is a strategic project, which will help raise the Polish FIFA community to the next stage. We are very glad to see the engagement of both Ekstraklasa itself and all of the clubs and the fact that they see potential in esports. This is also great news to all Polish FIFA players who can take advantage of the tournament to enter the official club rivalry and compete for points on the road to the FIFA eWorld Cup 2019™ finals,” says Konrad Wójciński, Marketing & Communications Manager at Electronic Arts Poland. “We are very happy to see that Ekstraklasa sees the potential of esports and is ‘joining the game’ with the media support of Polsat Games. The possibility to watch top FIFA 19 players competing on TV is great news for both gamers and football fans. We also hope that Ekstraklasa Games is only the beginning of the joint history of traditional sports and esports in Poland and that similar projects will make a permanent home for themselves in the calendar of esports events” says Bartosz Pawlik, director of the Polsat Games channel.